The Black handle on the BK22 Becker Campanion is made from Ultramid®. Ultramid® is a custom made polymide by BASF and is known for its high mechanical strength, stiffness and thermal resistance. The Fixed Blade on the BK2 Becker Campanion by Becker Knife & Tool of KA-BAR® is made from 1095 CRO-VAN Steel and features a Flat grind blade. 1095 CRO-VAN steel is an easy to sharpen, plain carbon steel used in knife making. 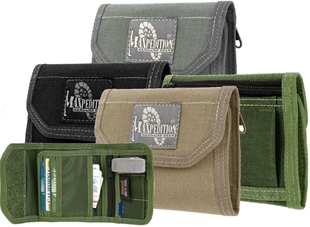 Proven to be one of the most popular steels used in KA-BAR Knives. With a Rockwell hardness rating of 56-58, this Chisel shaped blade is 5 1/4 inches long and is stamped with BK&T/KA-BAR. With its sharpened edge blade the BK2 Becker Campanion by Becker Knife & Tool of KA-BAR® is perfect knife for all tasks. Included with the BK2 Becker Campanion by Becker Knife & Tool of KA-BAR® is a Heavy Duty Polyester sheath which is made in China. 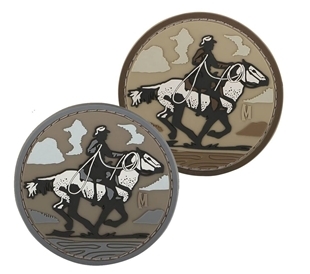 Maxpedition®'s Cowboy 3D PVC Morale Patch features a cowboy holding a lasso while riding a horse. If you are a bit of a "cowboy" show it off by attaching this hook and loop 2.43 x 2.43 morale patch to your gear or clothing. Available in arid or SWAT.